First Sign drug screen 6 Panel Drug Test Cup is easy to use, no step, donor friendly urine specimen cup with results in just 5 minutes on the spot onsite screening. Shelf life 16-24 months, 12 months guaranteed. (25 cups per box) includes security seals, procedure card, free gloves and product insert with every box of 25 ordered. FSCCUP-564 OXY BZO COC mAMP OPI THC only $2.99ea. 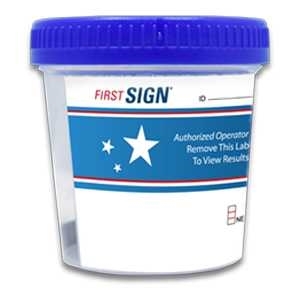 First Sign Drug Screen 6 Panel Drug Test Cup offers no dipping, no dripping and no tipping. The First Sign 6 cup detects 6 illicit drugs of abuse. First Sign is a donor friendly specimen cup and is ideal for pre-employment, random, post accident drug testing and screening. Testing for these drugs of abuse: OXY BZO COC mAMP OPI THC (25 per box) Product code #FSCCUP-564 6-Panel, 25/BOX only $2.99EA.